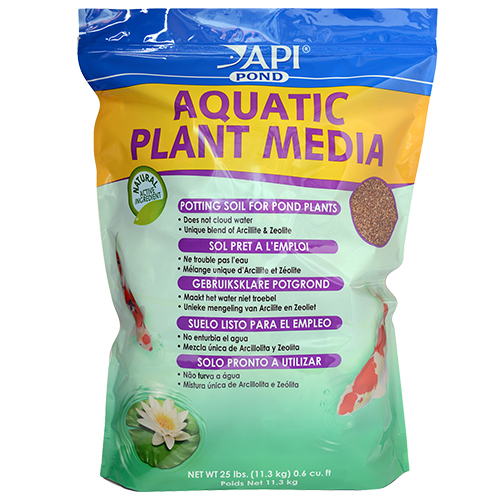 PI Pond Aquatic Plant Media is an aquatic plant soil recommended for all potted aquatic plants, including water lilies, lotus, iris, and bog plants. It is comprised of a unique blend of natural minerals, including zeolite, which provides a clean, easy-to-use planting media which does not float or cloud water. API Aquatic Plant Media traps and holds nutrients from aquatic fertilizer tablets that otherwise could leach into the pond, securely holding the plant in the pot. Product is safe for use with fish. May be used during spring start-up, or when adding new plants to your pond.